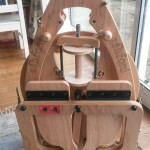 The Jacob Humbug spinning project was finished in April. 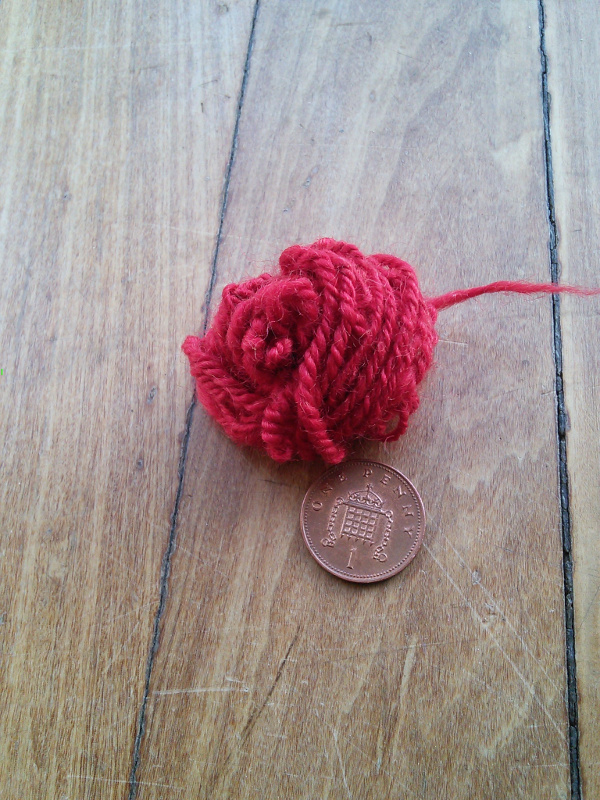 I’ve got about 125g of a 2ply yarn, of somewhat variable thickness. 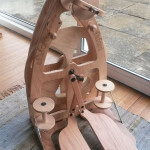 The singles rested for quite a while before plying, so it was quite tricky to figure out how much to ply. The tricks I learned last year at Wingham Wool work rather rely on the singles being still quite full of energy. Anyway, I went ahead and tried to overply it. 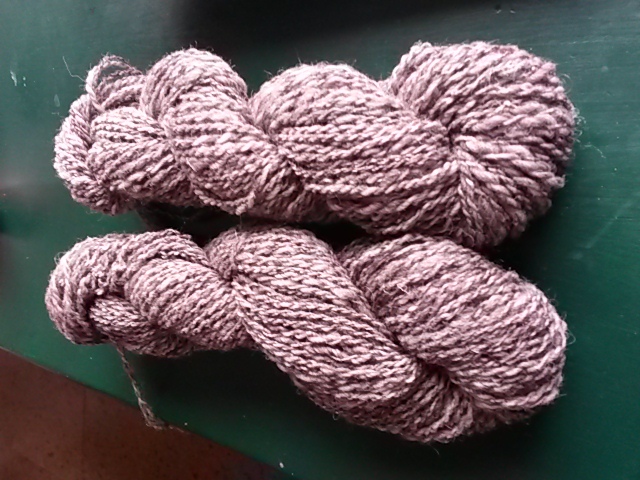 One skein is completely balanced and one is very slightly… underplied. I’ve found some useful nails outside the kitchen, under the overhanging roof, for hanging skeins to dry. I have no idea what the nails are actually meant for, but they do the trick. They are sheltered enough that, even if it rains, the skeins still dry. The two skeins are awaiting inspiration for their final destiny. They might be a little too tough to be worn next to the skin. Possibly a cushion cover or tea-cosy? 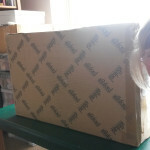 A big box arrived and we were very excited. 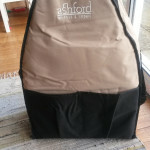 With just a little construction, an Ashford Joy 2 appeared. Hurrah! 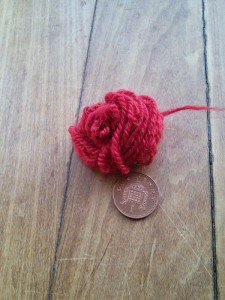 I began to spin, using some bright red BFL that I bought from Grace and Jacob while they still had a bricks and mortar shop in York. 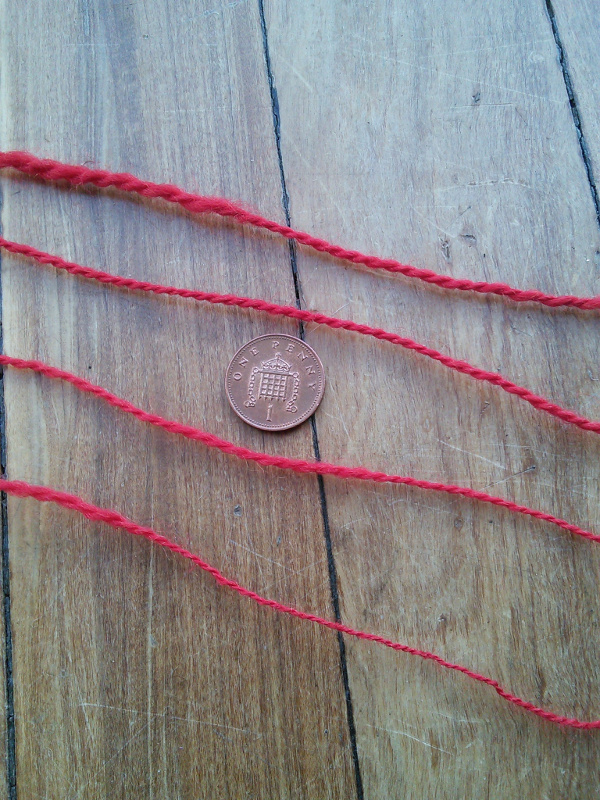 I managed to spin a variety of thicknesses, just by changing the tension and speed. I’m not yet at the point of being able to keep spinning the same thickness for more than a few yards, but getting better each time I try. I spun up a little onto two bobbins, plied it, washed it and set it to dry. 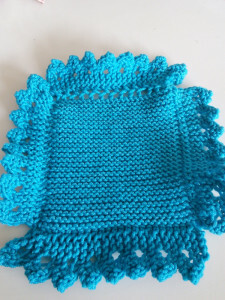 Then I knitted it! 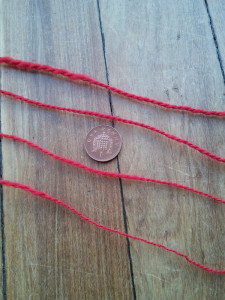 The two bobbins I had spun weren’t evenly loaded, so I had some left over on one of them, but only a few yards. I thought I might as well have a shot at Navajo plying, having seen a few videos of people doing it. Now that’s fun (I didn’t have much control over it)! The next spinning project is to keep doing a few more samples, aiming for consistency over several yards. If you remember, I have elected to have spinning as my personal project for a leadership course I’m doing with work this year. The next residential is in a few weeks time so I ought to have made some more progress to show them. Well, actually, no – not a literal wrap but rather some socks, a strange square item and a blanket. It’s all about finishing projects this year. I’ve been aiming for one a month and I’m up to date. April came in a few days late, but the camouflage lace socks are done and dusted, a mere 11 months after their debut on the needles. They really did come out pretty much exactly as I hoped. The camouflage colours have pooled and swirled exactly as needed, particularly on the legs. 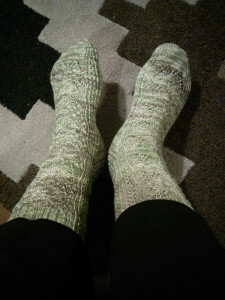 The feet are almost striping, but not too regularly. Here’s the nice daylight shot. The boring but beautiful garter blanket has been finished, along with a little surprise extra, meeting my arbitrary May finished item deadline, but steaming right on past the arrival of Baby Joshua, who is now over a week old. Never mind, he’ll get it before too long. 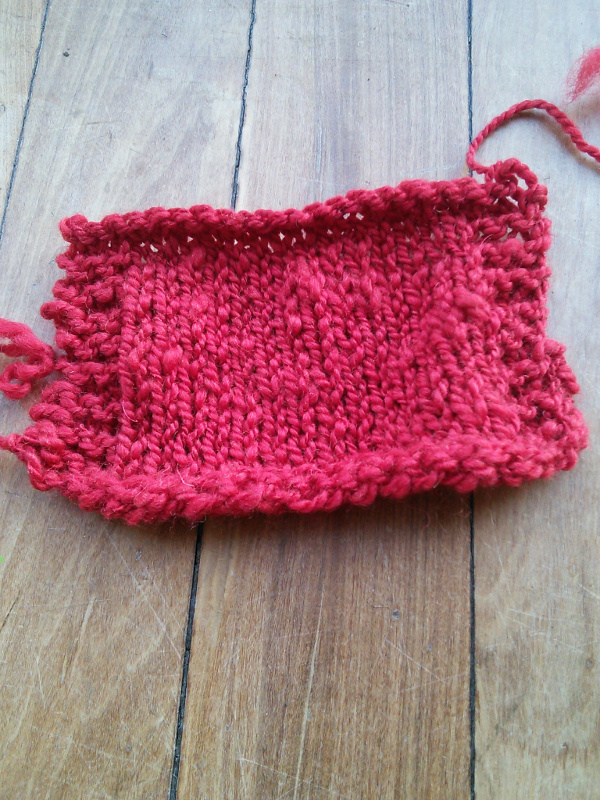 There were a LOT of ends to sew in, but I think I got the hang of sewing in ends on garter stitch after a while. It is the sampler piece for Franklin Habit’s Craftsy class on Heirloom Lace Edgings: four pieces of the same edging attached in different ways: one knitted on, one in herringbone, one in whip stitch and one in a modified version of mattress stitch. It’s been a good exercise, and I could listen to Franklin all day. This item is definitely one to tuck away in a box somewhere: I can’t think of a sensible use for it. I have one more chapter in this class to listen to and work through, then onto one of the spinning classes I bought in the sale earlier in the year. We got a Google Chromecast earlier in the year and it has really come into its own with the Craftsy classes. I watch them using the Craftsy app on the tablet, then cast the screen to the tv. 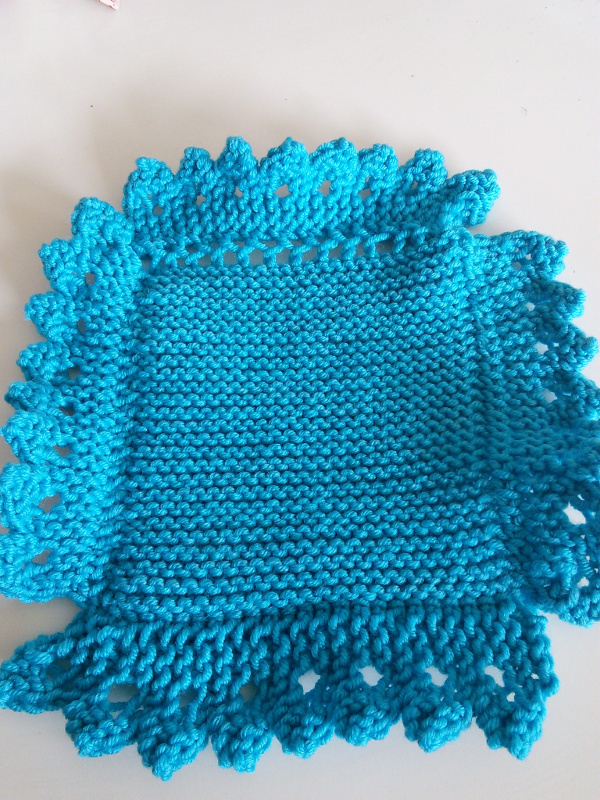 The crochet amigurumi project has gone into hibernation – in fact it has gone home with my Mum to be finished. 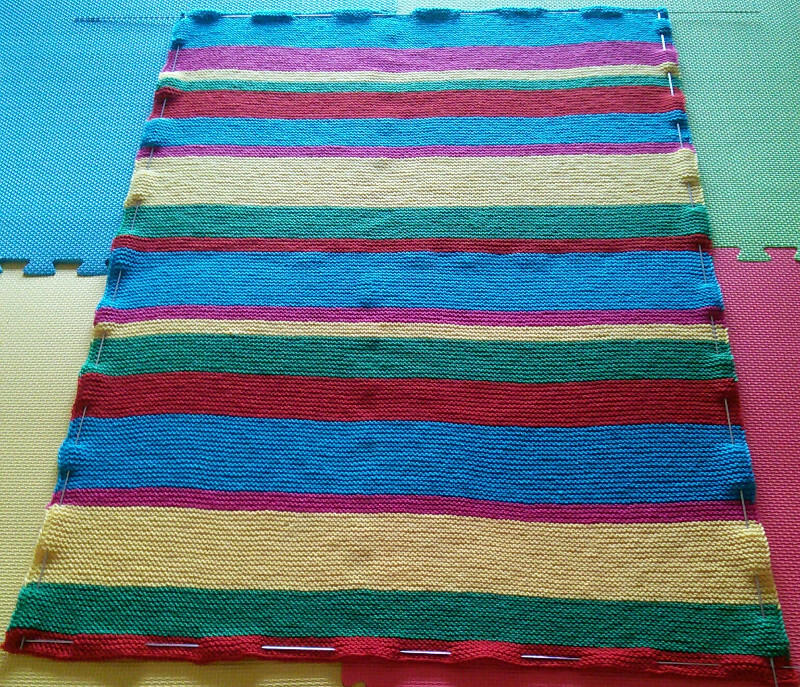 I don’t like the yarn, or the tight gauge needed for stuffed objects and I can’t face making another three elephants. Happily, Mum can. New item: Rachel Coopey’s Greebo socks in the Greebo colourway from Knitting Goddess. 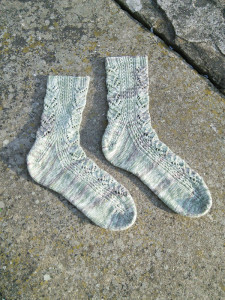 This is a same-difference set of sock yarn: one set of yellow yarn with grey bits and one set of grey yarn with yellow. New item: Ianthine: A Curl from Hunter Hammersen’s book Curls. Using lace-weight handspun that I bought from Grace and Jacob when they had their shop in York. 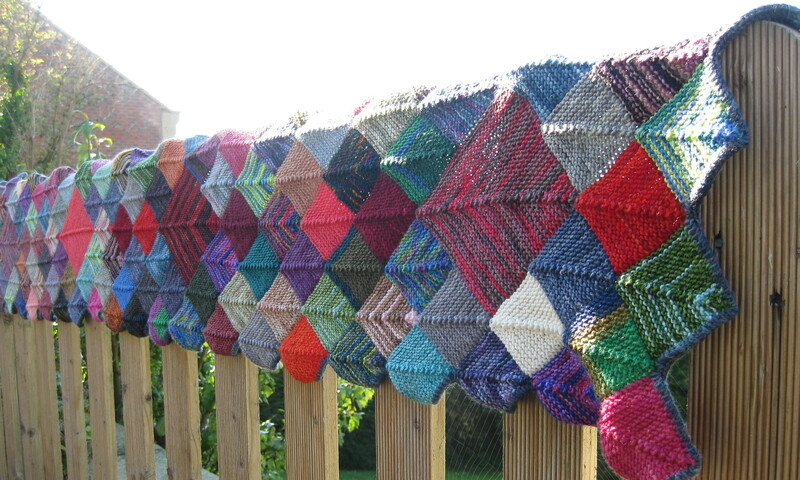 There really isn’t enough of the handspun for a full scarf, but I can’t think what else to use it for. At least with a Curl, you just keep going until all the yarn is gone and there isn’t really a right size for it. I tried a few different gauges until I found one I liked. 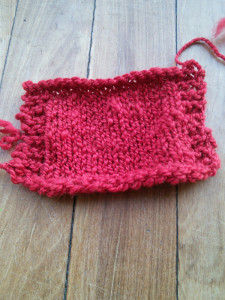 It’s been a while since I knitted with lace-weight. I did pick up Jonathan Strange and Mr Norrell again. I started from the beginning and got about two chapters further on than I did last time before getting bored. I will try and finish it, but I really don’t care much what happens to the characters. I’ve got the new BBC dramatization recording, so I would like to finish the book before watching that. I got sidetracked into a complete re-read of The Earth’s Children series by Jean M Auel. Biographies are always part of my reading life: perhaps the only non-frivolous reading I regularly commit to. This spring I’ve really enjoyed Rowan’s Rule: The Biography of the Archbishop, by Rupert Shott. Now I’ve moved onto Alan Turing: The Enigma by Andrew Hodges. The biography of Rowan Williams was very interesting from a work point of view, since it analyses events and trends from the recent past. Looking back, it puts a different perspective on it than it felt living through it at the time. I’m rather enjoying the mathematical bits of the Alan Turing book. So far, it’s a good general introduction to the state of mathematical thinking at the beginning of the 1930s, as well as a horrifying view of the lack of respect for scientific education at the time. I also finished the complete re-read of the Yarn Harlot’s blog just after Easter and very much enjoyed it. It’s like spending time with someone you know very well. Bizarre, this blogging thing, isn’t it? The number of people whose blogs I’ve been reading for years without them knowing the first thing about me. That needs a whole other post I think. There is yarn.